a prefecture located in the Kansai region on Honshu, the main island of Japan. It is the center of Osaka-Kobe-Kyoto area.
. Osaka - Entries of this BLOG .
. Tenmangu Festivals 天満宮　大阪 .
. Yasoshima Matsuri 八十島祭 Festival of the Eighy Islands . Osaka Tourist Guide Web Site. Sometimes mis-read as Gofuku Jinja ごふくじんじゃ. Gofuku is the common name for kimono fabric. 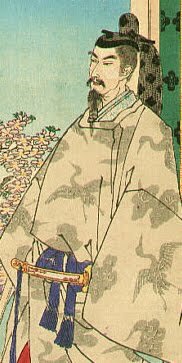 When Kureha Hime died, Emperor Nintoku was 76 years old. He build this shrine in her honor. It was lost in a fire during the times of Oda Nobunaga, but Toyotomi Hideyori had it bulid again. The present hall dates from 1969. On the 17th and 18th day of the ninth lunar month, now October. During the time of Emperor Ojin 応神天皇 there came two famous weaver girls from the Chinese country of Go 呉 Kure. Hatori is a special reading of hataori 機織, weaving. They taught their skills to the local womenfolk and started a good business. They are venerated at this shrine. 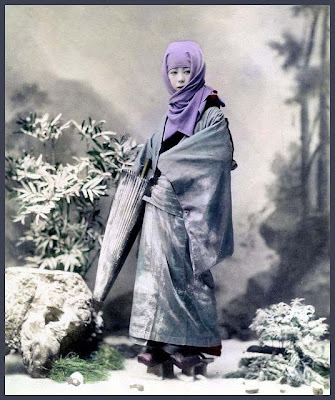 Tradition has it that in the Tumulus period about 1600 years ago during the reign of the Emperor Nintoku, two female weavers named Kureha and Ayaha traveled far away from the land of Go in China and reached here Ikeda, to introduce the technology of weaving into Japan for the first time. At the bank along Inagawa river flowing in Ikeda, there is a stone monument inscribed the place where two ancient weavers reached to introduce weaving. It is said that the ancient female weavers hanged the silk they dyed on a pine tree, and the pine tree was called “Kinugake”. There remains the name of address Kureha in Ikeda now. The bridge crossing Inagawa-rever is also Kureha-bridge.
. Oojin Tennoo 応神天皇 Ojin Tenno . was the 16th emperor of Japan, according to the traditional order of succession. No firm dates can be assigned to this emperor's life or reign, but he is conventionally considered to have reigned from 313–399. constructed a thorn field bank called Namba no Horie to prevent a flood in Kawachi plains and for development. It is assumed that this was Japan's first large-scale engineering works undertaking. constructed a Yokono bank (Ikuno-ku, Osaka-shi). Daisen-Kofun (the biggest tomb in Japan) in Sakai, Osaka is considered to be his final resting place. 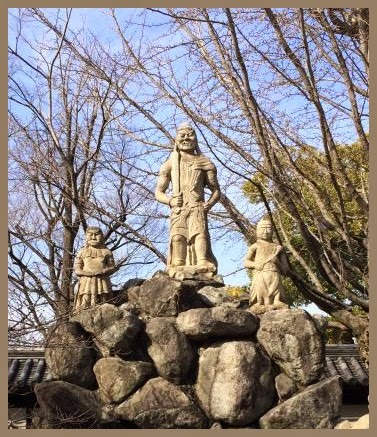 The actual site of Nintoku's grave is not known.
. Miyake Shozan 三宅嘯山 Miyake Shoozan . yome is also used by men talking about their wifes. So maybe he brought his wife to the shrine to pray that she makes better robes for him. beloved by the public under the nickname Zama-san, and worshipped as an ancient deity of residence protection, travel safety, and safe delivery. 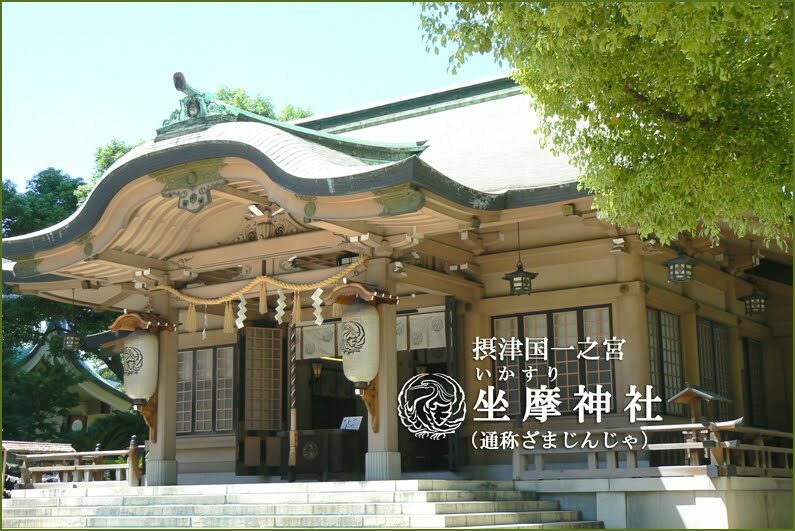 It is said that the shrine was established when Empress Jingu enshrined Ikasuri-no-kami 座摩の神 at the mouth of the Yodo River when she returned from overseas. On the other hand, according to the Engishiki (the classical compendium of rules), Hideyoshi Toyotomi moved the shrine of the guardian god of Settsu Nishinari-gun, formerly located on the south end of the Watanabe Bridge around Temmabashi, to this new location along with its name in the 11th year of the Tensho Period (1583), in order to build Osaka Castle. From then on, merchants and entertainers gathered and the region thrived, and this resulted in second-hand shops and ceramic wholesale shops gathering around the area. 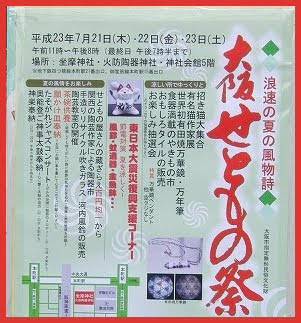 Within the premises is the Toki (ceramics) Shrine, and the Toki Ceramics Festival (tooki matsuri 陶器祭り） is held on July 23 of every year. 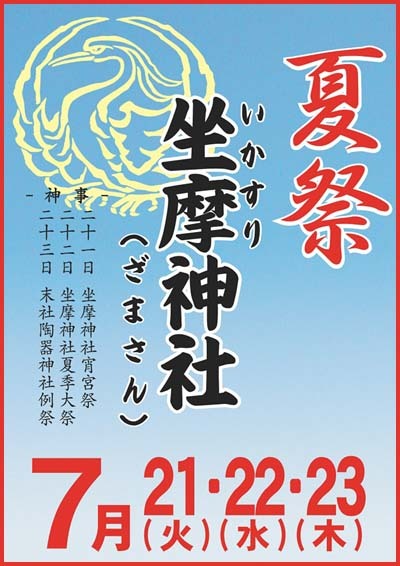 For the Jizoo-E 地蔵会 Jizo Festival on July 21 - 23. A gourd to prevent fire is hung from a Sasa reed branch. This Jizo is a Shogun Jizo from Atago 愛宕山将軍地蔵, who comes to extinguish fires with the water from his gourd. A small clay bell is also hung from the twig.
. Atago Jinja 愛宕神社　Atago shrines . and are helpful for a safe travel and easy childbirth. 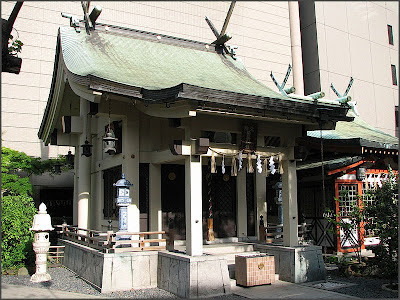 When Emperess Jingu looked for a place for this shrine, a group of white herons from Tamino no shima 田蓑島 (now near Tenmanbashi bridge 天満橋) came with pine twigs in their beaks to show her the place.
. Somin Shorai 蘇民将来　. 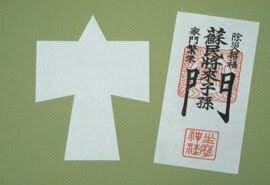 People prepare paper dolls (hitogata 人形, katashiro 形代 ) and float them on small paper ships to take away bad fortune. Also read "tokoshizume no matsuri." At the commencement of civil engineering or architectural projects, this ritual is performed to pray that the project proceeds safely and smoothly, and to pray that no structural problems arise after its completion. Other names for this ritual include jikanjō, shizume, jibiki, jimatsuri, chinsai, and chinsha. This ritual is performed before the preliminary foundation-laying stage of a given project. 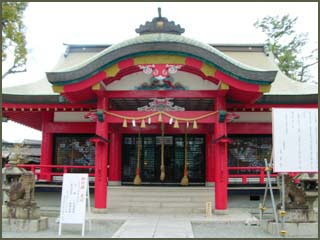 At the Grand Shrines of Ise, the pre-construction jichinsai rite is called chinchisai and is also repeated after a project is finished, a rite referred to as kō-chinchisai ("post-completion chinchisai"). 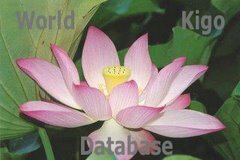 In most cases today, however, the rite refers obliquely to "the kami who controls this land," thereby directing the prayer to the specific kami of a given land without specifying the kami's name. 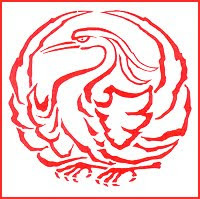 Ōjinushigami ("Great protector kami of the land"). Generally, a hand washing ritual precedes the ceremony. The ceremony itself begins with a purification rite and a rite beseeching the kami to descend. After that, the shinsen, or offering of food and drink, is made to the kami and the ritualist(s) recites a norito liturgy. Then they purify the site and scatter more offerings. Thereafter, the following three rituals performed in succession, the hallmark of the jichinsai ritual. First, a young girl performs the kusakarihajime (first ground-clearing) using a ritually pure sickle to start cutting the grass. Next, the girl performs the rite of ugachizome (first ground-breaking) using a ritually pure hoe to dig a hole. Third, the assistant ritualist performs the ritual burial of the izumemono (article of enshrinement) in the hole, but in fact the actual izumemono is buried after the ritual is over. These days, the article buried is usually an iron human figurine, an iron mirror, or a small iron dagger, but on occasion an iron spear, iron shield, or jewel may also be used. The ceremony concludes with a bow of thanksgiving, the scattering of more sacred food and drink offerings, and the performance of the rite for the kami's ascent. 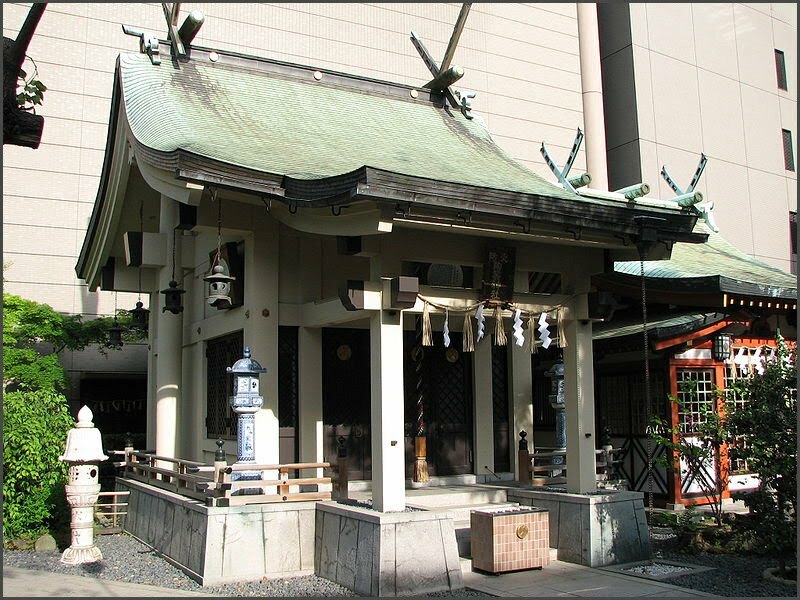 is the other shrine enshrining Ikasuri-no-kami. 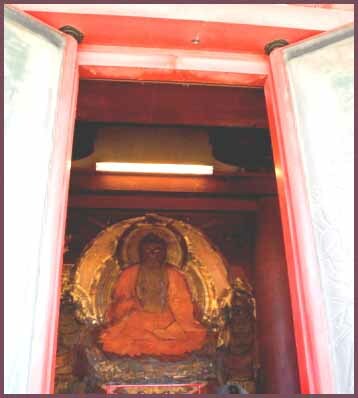 When Emperor Keitai (継体天皇) left Fukui to be the Emperor, he established the shrine and enshrined Ikasuri-no-kami and himself. Semba is a town of commerce and money surrounded by rivers on its three sides. The name Semba (ship's place) stems from the presence of a wharf there when canals were excavated and merchants were gathered to run Osaka, the then capital of a feudal lord's fief, in the 16th century. The area has a grid of "Toori" (streets　通り) from east to west and "Suji" (avenues　筋) from south to north. The streets ("Tori") are lined with textile, sundry goods, cosmetic and other wholesalers, where the avenues ("Suji") form a business center clustered with banks, stockbrokers' offices and other business firms. At Minami Semba on the north side of the subway station Shinsaibashi are many recently opened retail shops selling clothes, bags, stationery, tableware, sundry goods and other items. Not a few carries goods distinguished from what you find at department stores, attracting trend-conscious people. Semba also has unique restaurants, coffee shops and bars around, with ethnic restaurants newly opened one after another where you can enjoy Thai, Vietnam, Indonesian and other Asian cuisines. The interiors of many restaurants are decorated in fancy design, and they serve foods of different countries so that they draw many, mostly young, people. ***** . WKD : Ground-breaking ceremony (jichinsai ) . Shitennō-ji 四天王寺 is a Buddhist temple in Osaka, Japan. 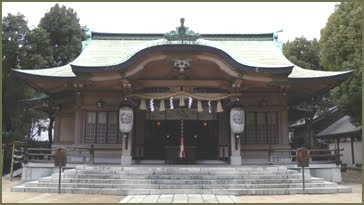 Prince Shōtoku is said to have constructed this temple in 593. 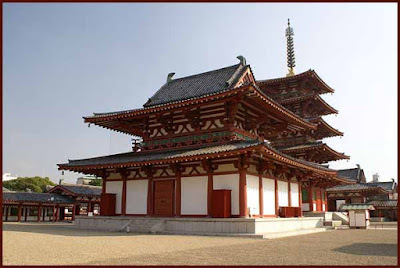 It is the first Buddhist and oldest officially administered temple in Japan, although the temple buildings have been rebuilt over the centuries. Most of the present structures are from when the temple was last completely rebuilt in 1963. 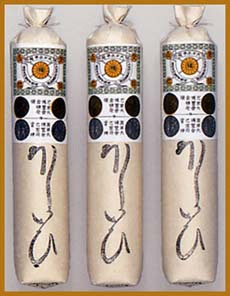 The Shitennō are the four heavenly kings. The temple Prince Shōtoku built to honor them had four institutions, each to help the Japanese attain a higher level of civilization. This Shika-in (四箇院, Four Institutions) was centered around the seven-building garan (伽藍) (the complex inside the walls), and included a Kyōden-in (Institution of Religion and Education), a Hiden-in (Welfare Institution), a Ryōbyō-in (Hospital), and a Seiyaku-in (Pharmacy) to provide essential care to the people of Japan. 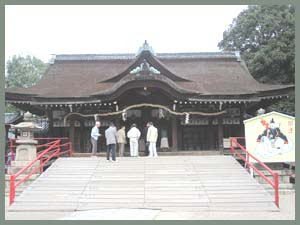 The temple has been called Arahaka-ji, Nanba-ji, or Mitsu-ji. Shitennō-ji is home to a major flea market on the 21st of each month.
. Shotoku Taishi 聖徳太子 and Daruma . Of 202 Buddhist sanctuaries in Osaka's Tennōji district, there is one that stands out - Shitennōji, the first Japanese temple commissioned by a royal (Prince Shōtoku Taishi) and one of the oldest Buddhist complexes in Japan. Construction began in + 593, just decades after the religion reached the country's shores. One of the carpenters for Shitennoji, Shigemitsu Kongo, traveled to Japan from the Korean kingdom of Paekche (Paekje 百済) for the project. Over a millennium-and-a-half, Shitennoji has been toppled by typhoons and burned to the ground by lightning and civil war -- and Shigemitsu's descendants have supervised its seven reconstructions. Today, working out of offices that overlook the temple, Kongo Gumi Co. is run by 54-year-old president Masakazu Kongo, the 40th Kongo to lead the company in Japan. His business, started more than 1,410 years ago, is believed to be the oldest family-run enterprise in the world. On November 16 at the temple Tenno-Ji in Osaka. Also at the temple Shinkooin 真光院（しんこういん）Shinko-In. 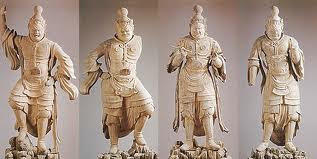 During the Edo period, stone Buddha statues were offered raw herring and the face smeared with white rice flour. Mikan wrapped in sasa grass leaves and straw were also offered. In the evening the straw and grass was burned until the face of the deity was all black and people danced around the stone. Three days before this event, children hang a rope over the way and ask for money if people want to pass. If they do not pay, they are "left out". This festival was said to have an evil influence on the education of children and was later abolished. Most temples in other parts of Japan celebrate this festival on January 14 or February 8.
. Dosojin 道祖神 the Wayside Gods . 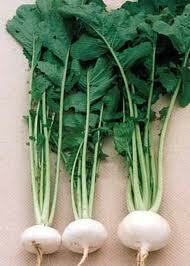 turnips from temple Tenno-Ji . They are also called Ukikabu 浮き蕪. They are the roots of another vegetable, the Nozawana 野沢菜. sometimes placed for "late winter"
A ritual at the end of the Shushoo-e 修正会 - a memorial service starting January 1st and dedicated to world peace and rich harvests - the event is said to date back to as early as 827. Two groups of young men in white and red loincloth and headbands wrangle in front of the temple to get the sacred amulet of the cow deity and some banknotes from the temple. They are showered with water by the onlookers to cheer them further. 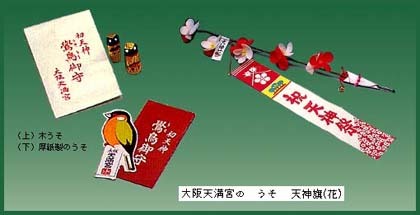 One of the three great festivals of Japan. At the Hall for Shotoku Taishi the birthday of the Prince if celebrated. "Every day we will offer ritual food"
The sacred bones of the prince are shown in the morning. The main officials and shrine carpenters, clad in traditional robes, performed the first ritual cut in a tree placed at the shrine.
. Ikukunitama Jinja 生國魂神社 / 生国魂神社 . 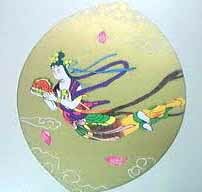 Ganzan Daishi is celebrated on November 3. 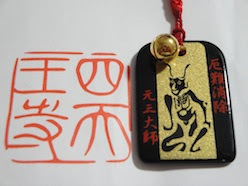 The amulet prevents evil influence and helps to learn and pass examinations.
. 元三大師 Ganzan Daishi .
. carving of a sleeping cat 木彫りの猫 . sange should get a page of their own ! Each represents a direction, season, color, virtue, and element. ***** . 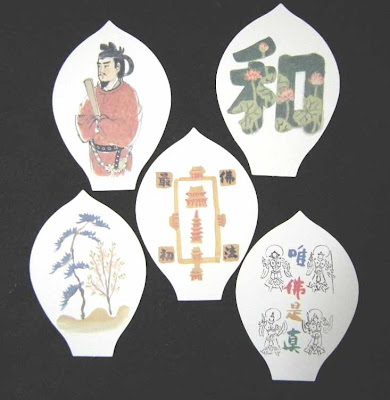 Deities of the Four Directions . Geisha, or geiko as they are referred to in Osaka (Naniwa) and Kyoto, are entertainers specializing in music, dance, tea ceremony, and conversation. Famous for its nightclubs, bars and late night restaurants, many business executives can be seen entertaining clients here. This district has 15 geiko, the largest number of the Osaka districts. (also know as Minami Shinchi or just Minami) Also famous for its nightlife, many of the establishments attract a younger crowd. 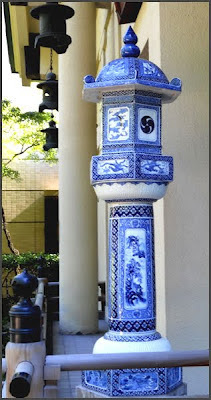 This district only has one teahouse, the Tanigawa Teahouse. It has six geiko. The geiko Naozuru, Fukuzuru, and Kotsuru are the three most recent additions to their numbers. The geiko of Osaka are known for their "herahera odori" or dances that feature acrobatic stunts such as handstands. Public dance of Nanchi (Minami) geisha district. These dances began in 1888 and is performed annually for one month beginning April first. The public dance of Shinmachi geisha district. These dances began in 1908. 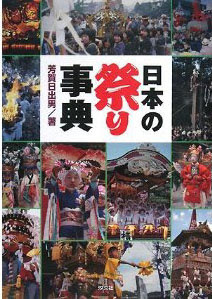 And like the Ahibe Odori are performed annually for one month beginning April first. Konohana Odori The public dances of the Horie geisha district. These dances are performed annually for one month beginning March 15. This is the common name used now for the geisha dances in Osaka.